Rules of Golf: Did Matt Every’s Caddie Breach Rule 14-3? 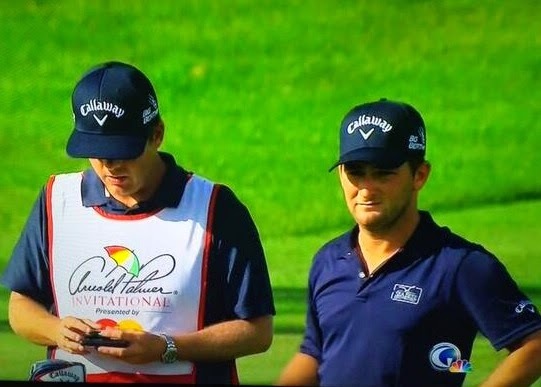 Did Matt Every’s Caddie Breach Rule 14-3? A. No. A compass only provides directional information and does not gauge or measure variable conditions or assist the player in his play. (Revised). This seemingly minor amendment to the Decisions has more widespread implications than is at first apparent. Those of you that have been following my blogs for some time may remember that because iPhones have an inbuilt compass that cannot be uninstalled, they could not be used during a competitive round, even if there was a Local Rule operating that permitted the use of distance measuring devices (DMDs). If there is such a Local Rule, the amendment now means that, like Android smart phones, iPhones with a distance measuring application installed may now be used during competitions, providing the application is not capable of measuring conditions, or supplying information about conditions (e.g. wind speed, temperature, or gradient). I recommend that anyone who may be confused about which measuring devices are permitted and which are not, check out the R&A’s recently updated and comprehensive Q&As on DMDs, with an accompanying flowchart, at this link.